Mark Anthony Welsh III (born January 26, 1953) is a United States Air Force four-star general who is serving as the 20th Chief of Staff of the United States Air Force. Prior to current assignment, Welsh served as the 34th Commander, U.S. Air Forces in Europe and Commander, Allied Air Command Ramstein, Germany and Director, Joint Air Power Competence Center at Kalkar, Germany from December 13, 2010 to July 31, 2012. He was responsible for Air Force activities, conducted through 3rd Air Force, in an area of operations covering almost one-fifth of the globe. This area includes 51 countries in Europe, Asia and the Middle East, and the Arctic and Atlantic oceans with a total population reaching nearly one billion people speaking more than 80 languages. He also had administrative control of 17th Air Force, providing support, logistics and resources to U.S. Africa Command. Welsh previously served as Associate Director of the Central Intelligence Agency (CIA) for Military Support and Associate Director for Military Affairs, Central Intelligence Agency, Washington, D.C. from August 2008 to December 2010. As the ADMA, he served as the principal advisor to the Director of the CIA on military matters and was the primary bridge between the CIA and the Department of Defense for the coordination and planning of military and interagency operations. Additionally, he assisted in the formulation of CIA policies regarding military affairs, managed the provision of direct support to deployed forces, and oversaw the Director of CIA representation at the combatant commands and senior service schools. 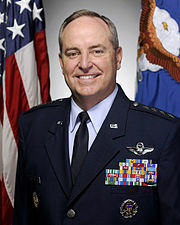 In May 2012, Welsh was nominated to be the next Chief of Staff of the United States Air Force. On July 19, 2012, Welsh testified in front of the Senate Armed Services Committee at his confirmation hearing, and was sworn in as the Chief of Staff of the Air Force in August 2012. General Welsh was born in San Antonio, Texas. He entered the United States Air Force in June 1976 as a graduate of the U.S. Air Force Academy. He has been assigned to numerous operational, command and staff positions. 1993 National War College, Fort Lesley J. McNair, Washington, D.C.
2009 Fellow, Pinnacle Course, National Defense University, Fort Lesley J. McNair, Washington, D.C.
July 1992 – June 1993, student, National War College, Fort Lesley J. McNair, Washington, D.C.
June 1993 – June 1995, Chief, Defense and Space Operations Division, Operations Directorate (J3), Joint Staff, the Pentagon, Washington, D.C.
June 1995 – April 1997, Commander, 347th Operations Group, Moody AFB, Ga.
June 1998 – June 1999, Commander, College of Aerospace Doctrine, Research and Education, Maxwell AFB, Ala.
April 2003 – June 2005, Director of Global Power Programs, Office of the Assistant Secretary of the Air Force for Acquisition, Headquarters U.S. Air Force, Washington, D.C.
June 2005 – June 2007, Deputy Commander, Joint Functional Component Command for Intelligence, Surveillance and Reconnaissance, U.S. Strategic Command, Bolling AFB, Washington, D.C.
August 2008 – December 2010, Associate Director of the Central Intelligence Agency for Military Support/Associate Director for Military Affairs, Central Intelligence Agency, Washington, D.C.
August 2012 – Present, Chief of Staff, U.S. Air Force, the Pentagon, Washington D.C. This article incorporates public domain material from the United States Government document "http://www.af.mil/information/bios/bio.asp?bioID=7550".